Probably in one of my drunken stupors.. I have always wondered if there is anything better for overall employment than shutting down coal plants? No matter what you replace them with it seems like it should be more labour intensive in some way. A decentralized solution means lots of small installations and centralized solutions means large infrastructure projects, at least the size of building new coal plants anyway. I think coal is worth around 800K jobs in the US economy (about 40% of mining is coal and mining employment in the US is about 2 million jobs). There are already over 1/2 million Americans working in the solar panel business. The question, to me, is how to get the new jobs to the places where the old jobs were? I am the burrito until someone hands me to a philosopher. Clint is actually pointing that thing at an empty chair. Sure makes my 800k estimate look good! Another industry where capital and technology are combined to eliminate a lot of the labour. I rarely read Krugman anymore but things always seem to point out to me what I miss by not reading it, but I still don't for some reason. I believe he said that this was people directly employed in mining coal, and that he made a clear caveat that it didn't include all related jobs. Still, it's been dropping as less companies and households want to deal with coal as a fuel. LGM has a post on the same Krugman piece. The decline appears to be more about strip mining and automation than decline of use (most coal going to large power plants, home use dropped rapidly in the 1950-60 era). 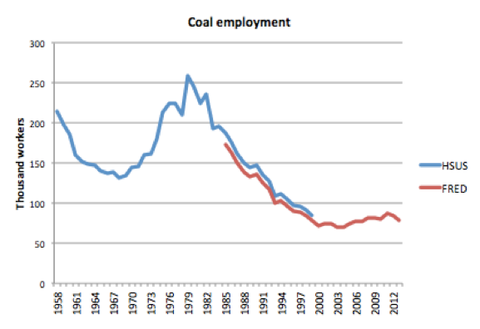 That's why I was careful to say 'total employment in coal mining' because that's the way Krugman put it. However, you can also see the all employees graph from fred whch seems the same as Krugmans. It took a few minutes to locate, but you can find a breakdown of employees by function type here: http://www.bls.gov/o...cs4_212100.htm The 80K includes all the peripheral functions (management, equipment operators, security guards, even the transportation aspects). Obviously it does not include the power generation jobs at coal fired plants, but since that energy will still be required, those jobs would shift across technologies, more or less. Crap on a stick, that is a small number of jobs. Of course the right-wingnuts want to save these jobs, which is ironic because they were more than willing to let the entire U.S. auto industry collapse. Not to mention all the state level jobs when they wouldn't continue the stimulus - but of course, government jobs (teacher, highway maintenance, etc) aren't real jobs in their reckoning. Heck its at least 10 times what Keystone XL would generate, so give 'em a break. What is 80k, about 12 days of current job creation? How the heck do you think he was able to reduce the deficit? Note that most of this job loss was in the states. The Feds just quit expanding. Would be useful to tease that out. So outside of the census bump, we see attrition, but no new positions. There were more federal employees in 1970 than now. US population in 1970 was 200 million and now it is 313 million. Technology explains a lot, but all of it? Yup, government can't creat jobs - we made sure of it! Notice the biggest decrease is during Clinton and Obama admins. This is how know your memes are successful: when the opponents are so concerned with having them used against them that they cave. This is a two-fur for Republicans. 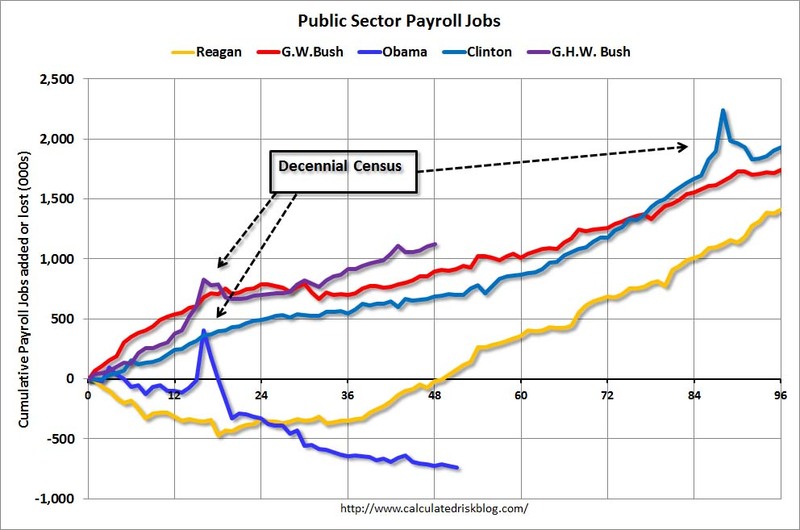 Decreased federal employment also means decreased services, which you can then blame on poor administration. This is the climate change topic, right?